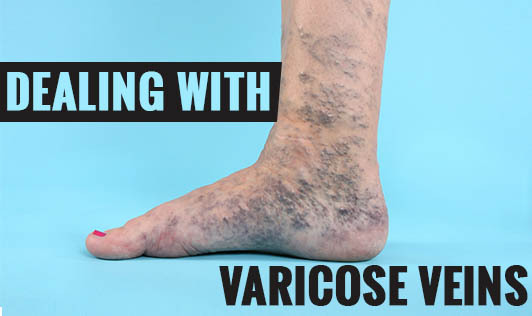 Varicose veins are enlarged and swollen veins, often linked to faulty valves in the vein. They are generally blue or dark purple. People with varicose veins on their legs may experience cramping pain and heavy limbs. In severe cases, the varicose veins may rupture or ulcers may form on the skin. Many women first develop or find that varicose veins get worse during pregnancy, this is because the uterus grows and puts pressure on large veins of the body which eventually increases pressure in the veins of the legs. • Lose weight: Obesity can make you less active which results in less movement of your leg muscles. The blood vessels in overweight people carry more blood than those of thinner people, so there's more strain on the vessels themselves which makes circulation an inefficient process. • Exercise: Exercise to lessen symptoms of varicose veins. Walking is a good way to improve the circulation in your legs. Exercises that involve leg movements will prevent blood from clotting. • Elevate your legs: If your work involves sitting for long hours, it's important for you to take short breaks to improve circulation. At home, you can lie down with your legs resting on 2 pillows to use gravity to pump blood from your legs to your heart which can lessen swelling and leg pain. • Avoid sitting or standing for long hours: It's important to move every 30 minutes to improve blood flow, especially if your job requires you to sit or stand for long hours. Avoid sitting with crossed legs, as this position creates circulation issues. • Check your seat: If you sit in a chair with a seat that is too deep for your leg length, consider changing it. Because the front edge of the chair digs into the back of your knees, compressing blood vessels and restricting blood flow. So it's important to get a chair that fits your body better. If these tips don't help and the pain in your varicose vein continue or become severe, contact your doctor!